Well it's here, it's finally here! 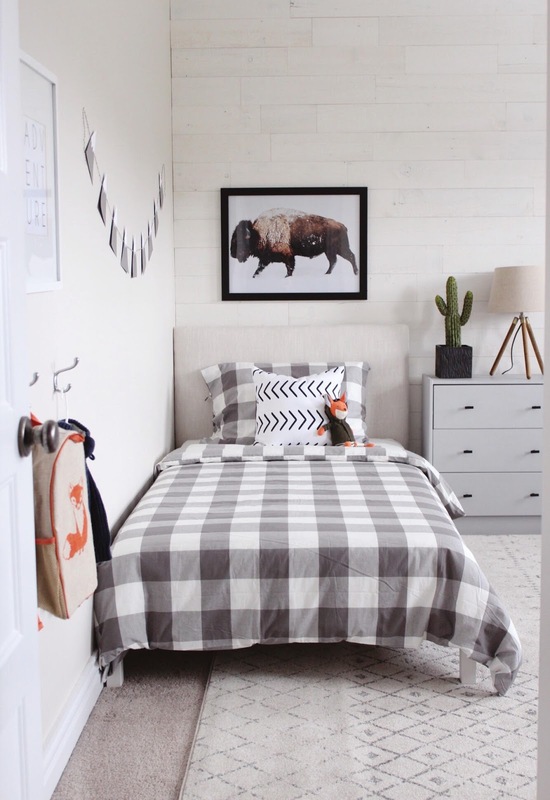 I can't believe that it is actually reveal day and my little boy's room is complete. I have to say, this journey had its doubts and there were times I wasn't sure if it was going to be finished on time. But everything came together in the end and to say I am in love with how it all turned out would be an understatement! So without further ado let's go inside.. There are a couple of key elements that I feel really make this space, first being the Stikwood rustic shiplapped accent wall. This wall is in the Hamptons finish and guys... I am dying over this and can't believe how easy it was to install and how beautiful it looks. I actually have a whole post coming soon on the process so stay tuned for that! 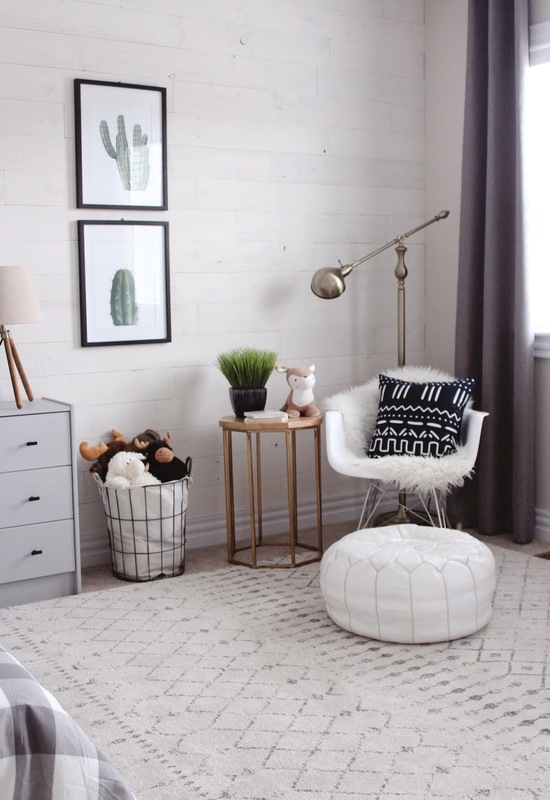 The second thing is definitely the Nuloom Blythe rug, I am in looooove with this rug, the pattern, pile everything is just perfect and it has such a nice grounding effect in the room. 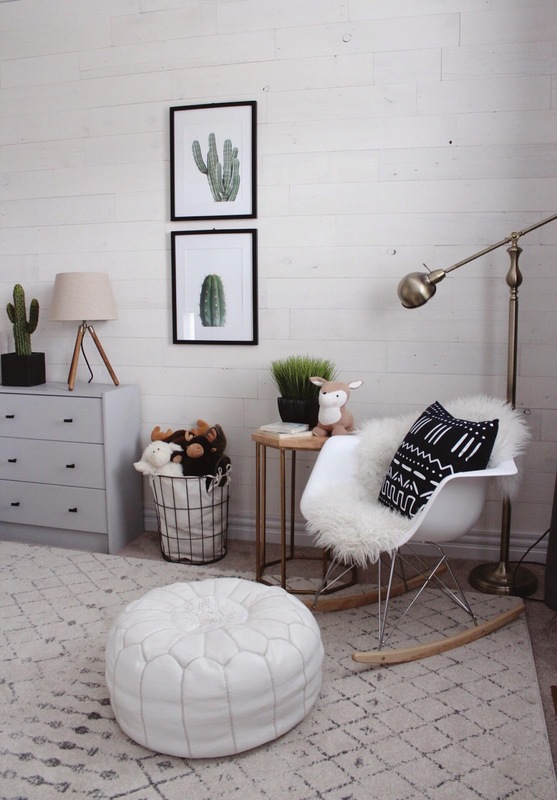 The little rocker in the room with the side table and floor lamp looks so cozy and is the perfect spot to grab a book and snuggle or to give my little one a bottle. It's nice having a smaller scale rocker in the space now that we are out of the nursing and rocking to sleep phase because it allows for more play room but still also provides another seat in the space. The throw pillows are from Girliture along with the printed pillow on the bed and they are just the perfect touch to the space. Textiles always warm up a room and these particular prints look so great with the other patterns in the room and bring in a nice cozy layer. The little dresser by his bed is one that I chalk painted a light gray and added new black hardware to. 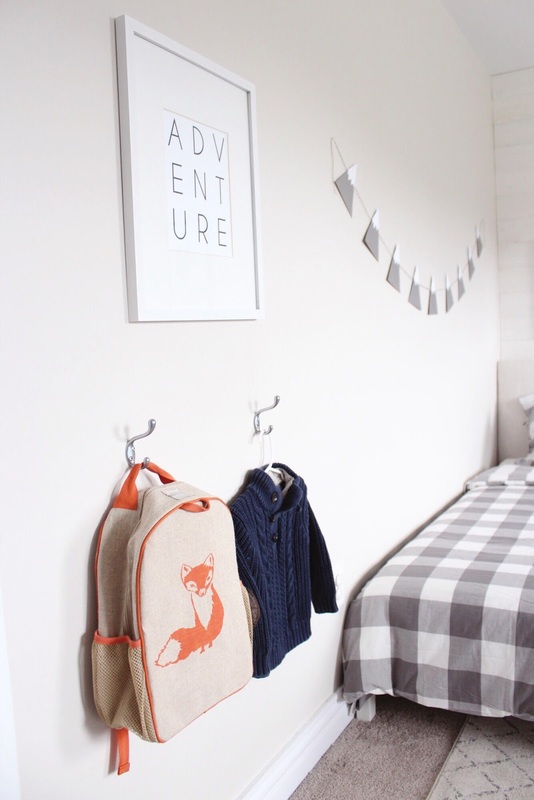 It is such an ideal size for beside the bed but also provides adequate for clothing, diapers, wipes etc. He also has a very large closet so that houses a lot of his clothing and larger toys. 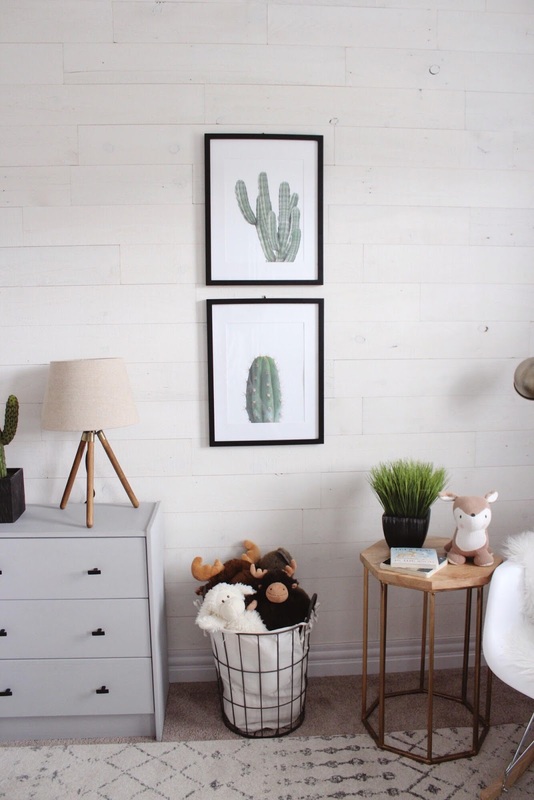 All the art in his room looks so pretty and these green cactus prints add such a fun pop of colour and also go with our desert/outdoorsy theme we have going on. I love how they help break up the wall and frame in the reading/play area. 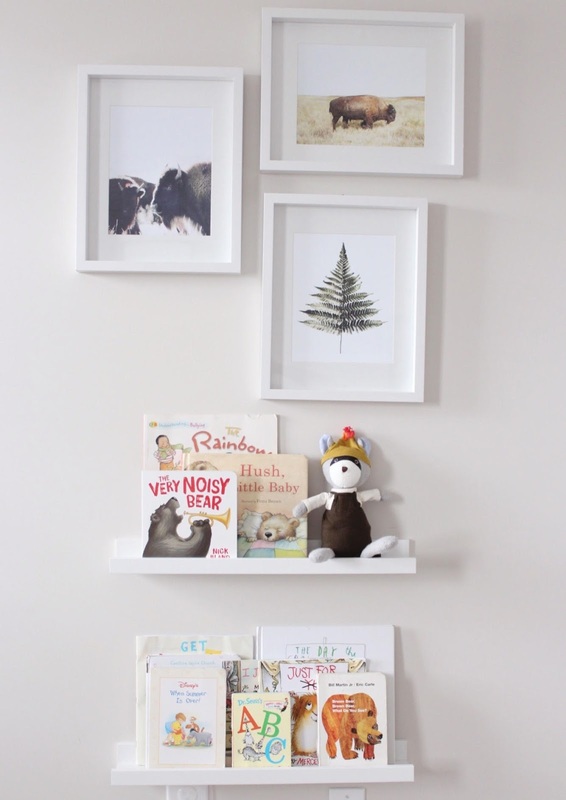 Of course you all know how much I love displaying books on the walls in kids rooms so of course that feature was staying in the space. But I just love how the new art hung in a unique shape really switches up the whole feel of the area from when it was set up as his nursery. And I mean can we just talk about these Hazel Village critters on the shelf!? They are so darling and plush and I just love how they look in the space. 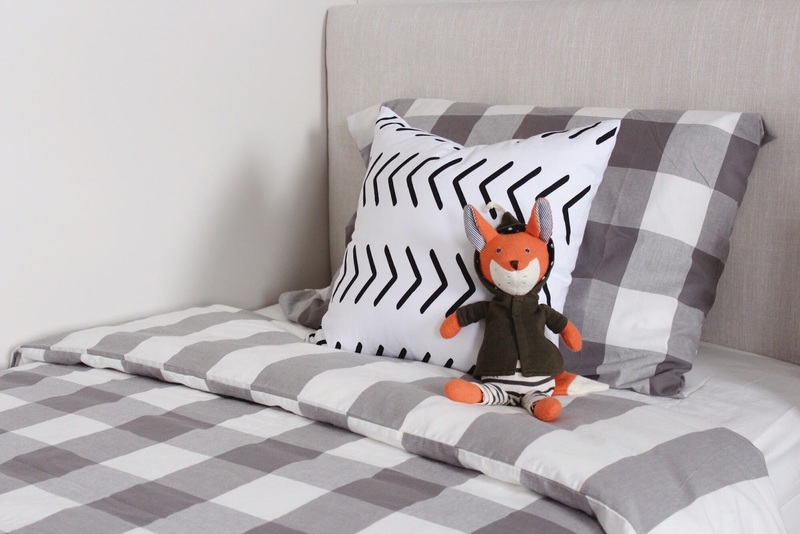 This is Max the raccoon and we have Reginald the fox on the bed which is equally as sweet! 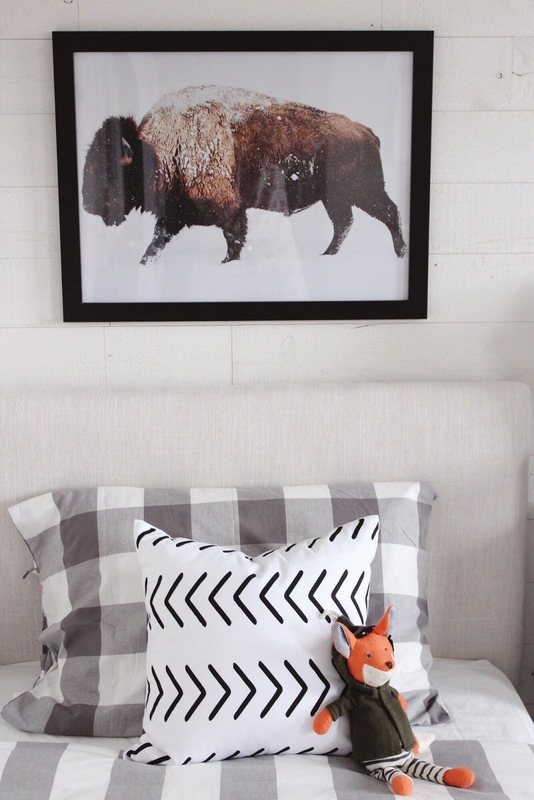 Also...this buffalo print over the bed is just amazing!! I am so obsessed with it and how it is the first thing you see when you go to his room. Having a larger scale piece of art in a bedroom is such a great way to make a statement and keep things fun. 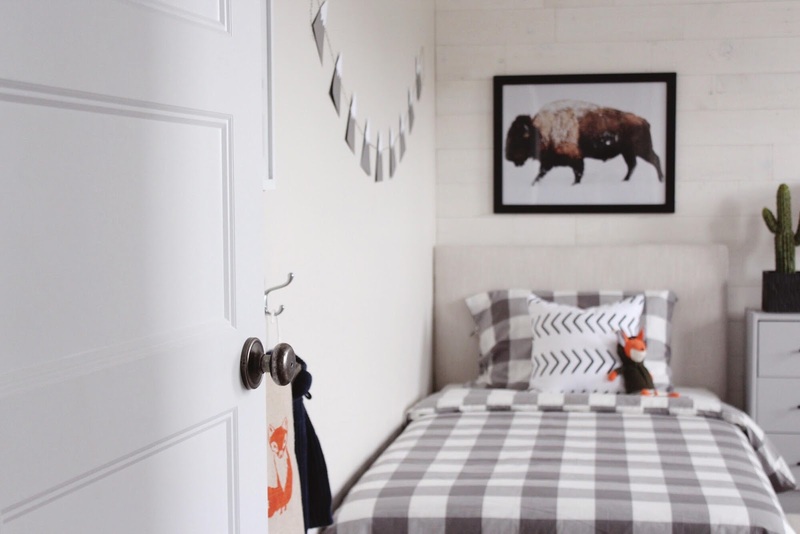 His bed was just a simple pine bed that I painted white and then built an upholstered headboard for. I used fabric I had left over from the first One Room Challenge that I did last year which worked out well. 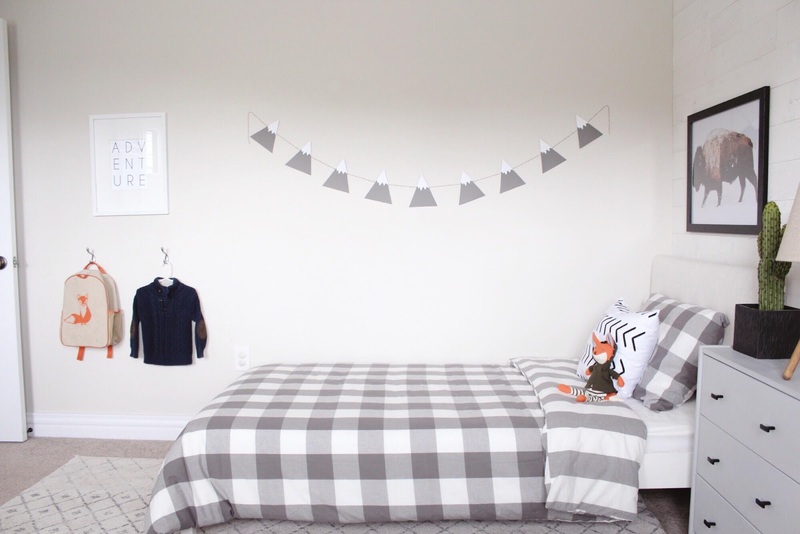 I made this adorable mountain bunting for the wall by his bed. 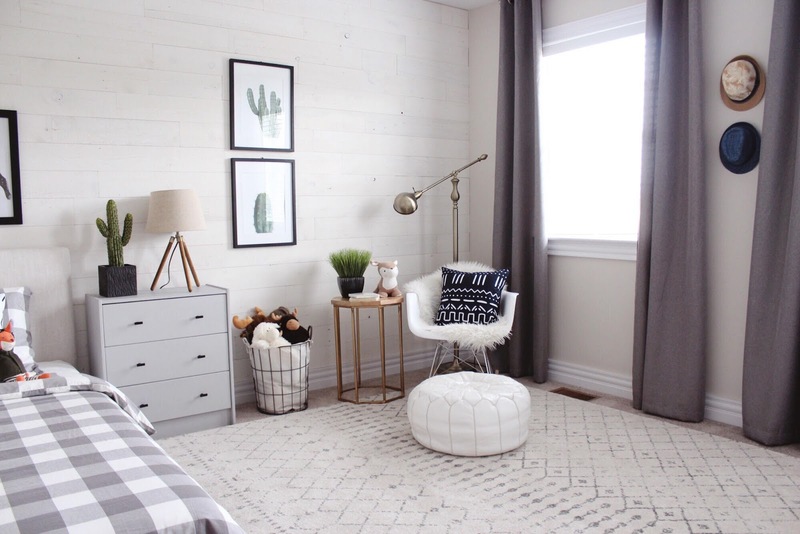 It's great because it's light and simple but dresses up that long area of the wall. It was so easy to make and considering what the same thing was going for cost wise online I was quite pleased with my little project! 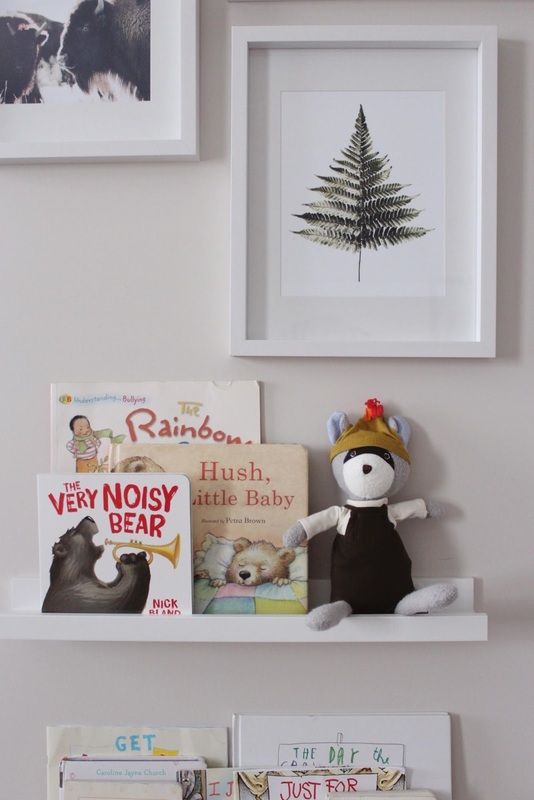 The decor and styling in his room is very simple because after all he is just turning two in a couple of weeks so I wanted it to still be a soft, cushy space for him to play and just act like the little boy he is. I hope you all enjoyed this reveal, as I said I am so in love with his new big boy room and seeing his face when he saw it all set up for the first time was just the sweetest moment. A big thank you to Linda over at Calling it Home for creating such a fun event and if you are just tuning in now you can check out the first 5 weeks of the challenge below. A big thank you to all the amazing brands I worked with for this space and I will be sharing a complete source list of the room on Monday! this turned out so well! i love the soft yet all boy vibe! Thank you so much I am so in love with that rug!! The final is just beautiful. The perfect mix of childhood and style. Kudos! Thank you so much. I really wanted it to be a space that would grow with him! Oh, I LOVE it!! The colors and textures are awesome! It is warm and inviting... What a great space! this room looks great! i love the rug you picked out. xo jillian - cornflake dreams ..
Would you mind sharing the wall colour?